We have created browser extensions for the Safari, Chrome and Mozilla Firefox browser. You can use these extension to quickly view your seedbox stats (disk space, traffic etc) and quickly perform several actions (restart slot, plex refresh etc) without the need to login in your client area. All extensions use our API access in order to operate. In order to use them, you need to get an API Key. After you log in to your seedbox account, click in the "My Client Area" button. 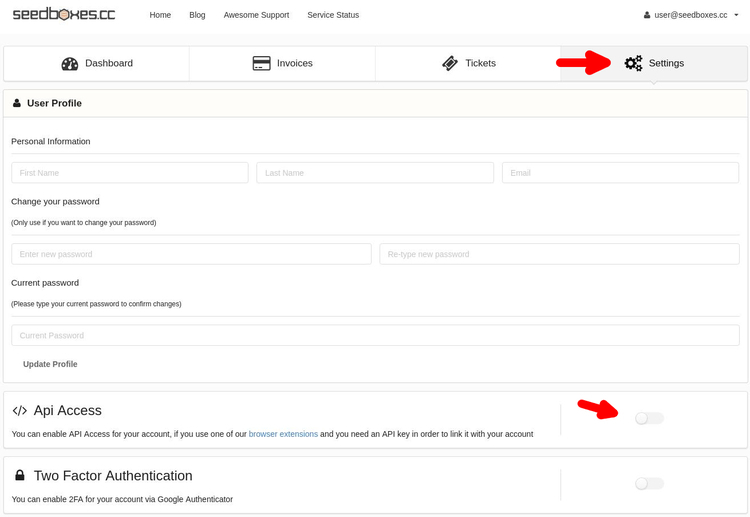 Go to your "Settings" tab and enable "Api Access" by dragging the round button to the right. Once your "Api Access" is enabled you can take your "API Key". After you install it, a new button will appear in your chrome toolbar. If you click it, it will ask you to import your API Key. 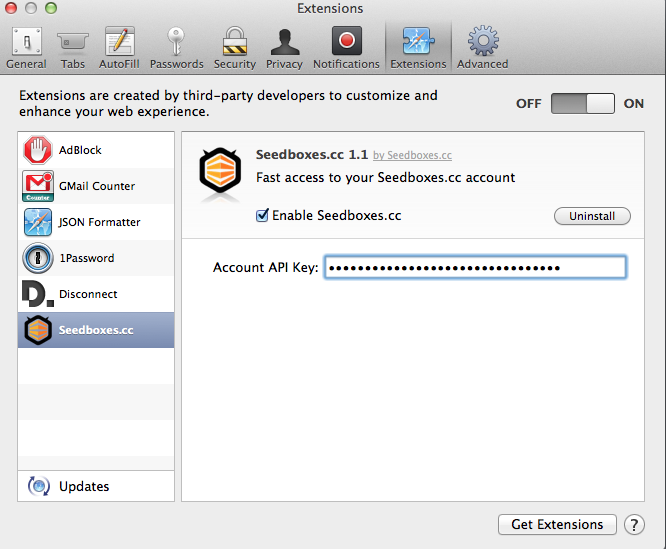 Safari will download a file named "seedboxes.safariextz". Double click that file. Safari will ask you for permission to install the extension. Press "Install"
In order to download the Mozilla Firefox addon, you need to go here with your Firefox and press the button to install the addon by pressing the button "Add to Firefox". Once installed, you can follow the same procedure as with Google Chrome above, in order to install your API key and start using the addon. You just have to click to the addon button once, then copy paste your API key in the field. Once you do this, just click the button once more for the window to close, and once you click it again to open you should see the information of your seedbox immediatelly!